I was wondering how compbatable the parts for a tm g17 were with a we g17 ? Just asking before I go spending £40 on the silver Guarder slide I have been looking at but I mean parts both internal and external.. Anyone able to shine some light on this subject for me ? Guarder glock slides are pretty consistently shite. Buy the WE-tech version built for the WE pistol instead. what about other parts do you know if they fit okay ? Some stuff does, some doesn't. It's a bit of searching the specific parts before you buy that's served me well with my we g17. So yeah searching around before you buy is your best bet. 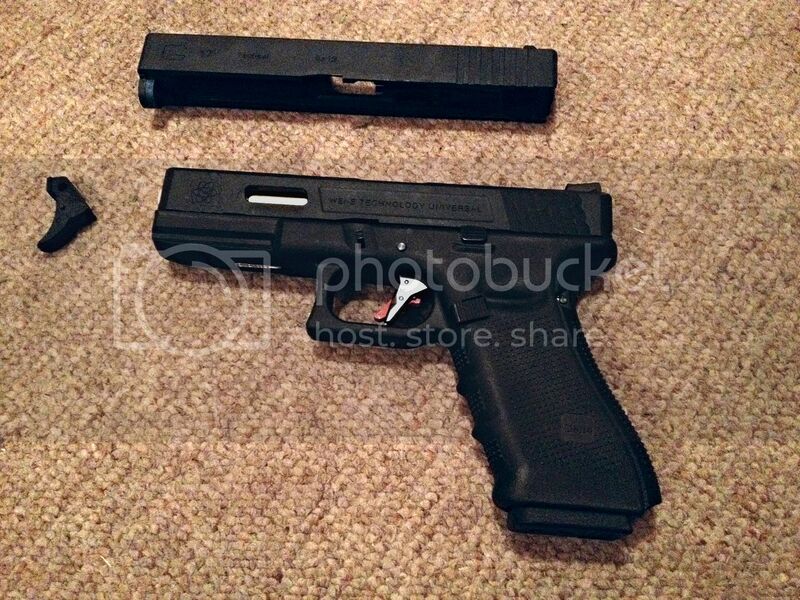 I have the Dark Grey version of this on my WE G17, slots straight on as it comes with all the internals. thanks for the input guys! appreciated! also mack I had looked at that slide on patrol base! £60 on there plus delivery so £37 from that site u linked plus free delivery is defo worth a punt from me I reckon! have u ordered from that site before ? all safe and secure etc ? also is that the SAI trigger u have on youre glock ?